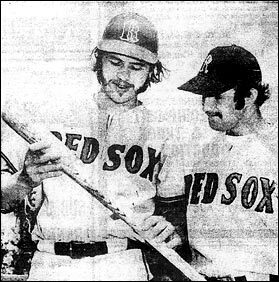 Left - Regina Red Sox battery mates, catcher Andy Logan (left) and pitcher Randy Sawa (right) appear together as Logan selects his lumber before stepping into the on-deck circle. 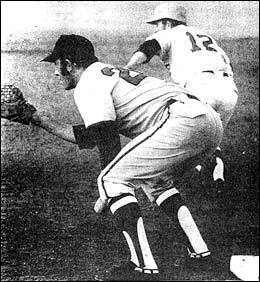 Right - Regina Red Sox pitcher Bob Currie attempts to pick-off Swift Current Indians' hurler and base runner Wayne Pusch at first base. Taking the throw is first sacker Jack Buch. 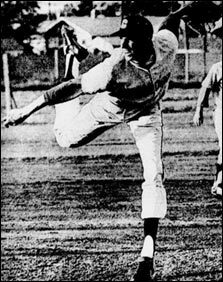 Left - Dennis Migliazzo of the Saskatoon Commodores uses all of his 6'6" in making his delivery. Migliazzo and teammate Tim Alcantar came to the Commodores from the highly-touted baseball program at Pepperdine University in California. 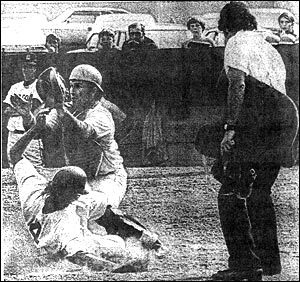 Right - Yorkton Cardinals' Nelson Bryksa bites the dust at home plate in front of Saskatoon Commodores' catcher Fred Maxemiuk while umpire Bill Remenda watches the play develop. Top Left - Saskatoon outfielder Tim Alcantar checks out the lumber. 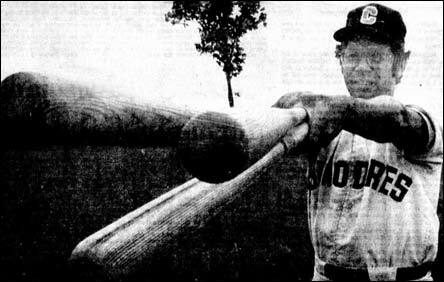 The California college star went on to win the Southern League batting title with a .380 mark. 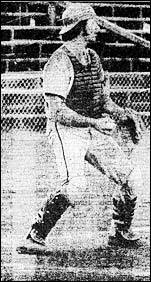 Top Right - versatile Fred Maxemiuk of the Commodores carries both a regular fielder's glove and his catcher's mitt. 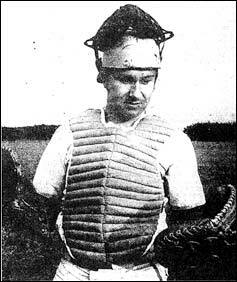 Below left - Regina catcher Andy Logan awaits a throw at home. Below Centre - Dave Renwick Saskatoon's third sacker snares a line drive. 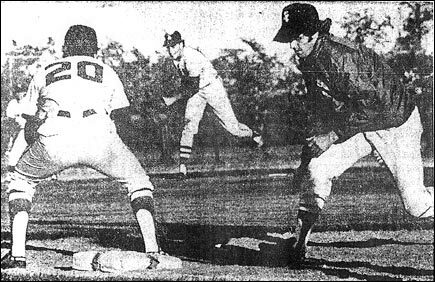 Below Right - Saskatoon's Fred Maxemiuk is off and running as Regina first baseman Jack Buch awaits a possible pickoff throw.